When in a skid, steer in the direction of the skid. Russia = I want to drive out of the skid, not into it! When in a skid take foot off brakes until traction restored. Russia = If I don't brake how will I stop? When in a skid put transmission into neutral until car points in right direction. Russia = Change down a gear and hit the gas. If unable to stop before hitting rear of car in front do not swerve. 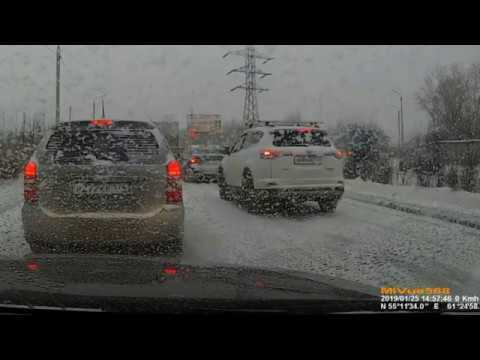 Russia = better to hit oncoming traffic or ditch. When roads are bad, slow down, maintain bigger gap to vehicle in front. Russia = weather getting worse, drive fast to get home. Anticipate accidents by watching what other drivers are doing. Russia = I don't care about the other guy – just me. Focus on driving and avoid distractions. Russia = texting, phoning, listening to radio & talking to passengers helps pass the time. The best way to survive an accident is to avoid having it. Russia = accidents are inevitable, might as well them while still young. I like to drive Russians drunk. You would think these people who drive in winter conditions periodically would know how to drive in said conditions. So you can't complile videos of American winter driving? Hard to believe the average I.Q in Mother Russia is 97. You didn't go big. So go home. Russian drivers are best ! "Slow down, the roads are icy, don't drive drunk." IT'S RUSSIA. DRIVING FAST, DANGEROUSLY AND DRUNK IS WHAT THEY WERE FOUNDED ON. What dont people understand about going slow when it’s bad weather out ? And you stay a good distance AWAY from the driver in front of you. So stupid. If you don’t know how to handle this kind of weather stay off the road and do us all a favor.